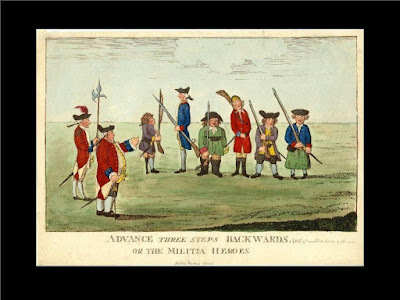 Advance Three Steps Backwards, (Word of command the last War by Col._) or the Militia Heroes, published by Matthew Darly, 1779, American Antiquarian Society. 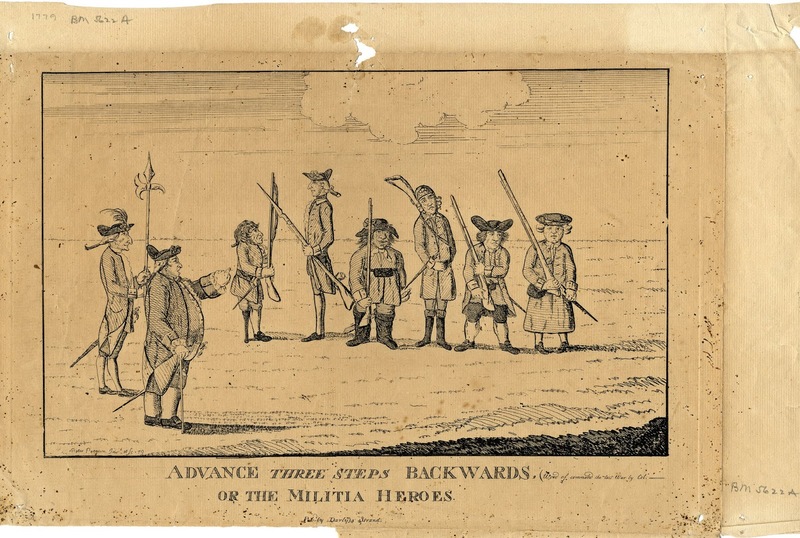 Advance Three Steps Backwards, or the Militia Heroes, published by Matthew Darly, c.1779, British Museum. 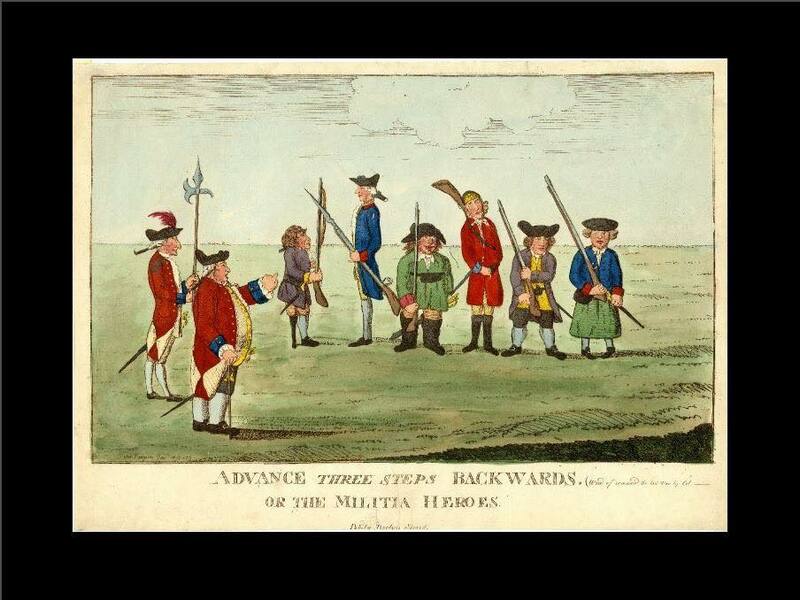 Advance Three Steps Backwards, (Word of command the last War by Col._) or the Militia Heroes, published by Matthew Darly, collection unknown. Thanks to follower Phil Hosea for bringing my attention to this print. I was unable to find the source of the third image here, so if you happen to know where it is from, please let me know! The rebellion in the American colonies was draining the British. With the entry of the French and Spanish in 1778, the war expanded across the globe and strained the Crown's resources. 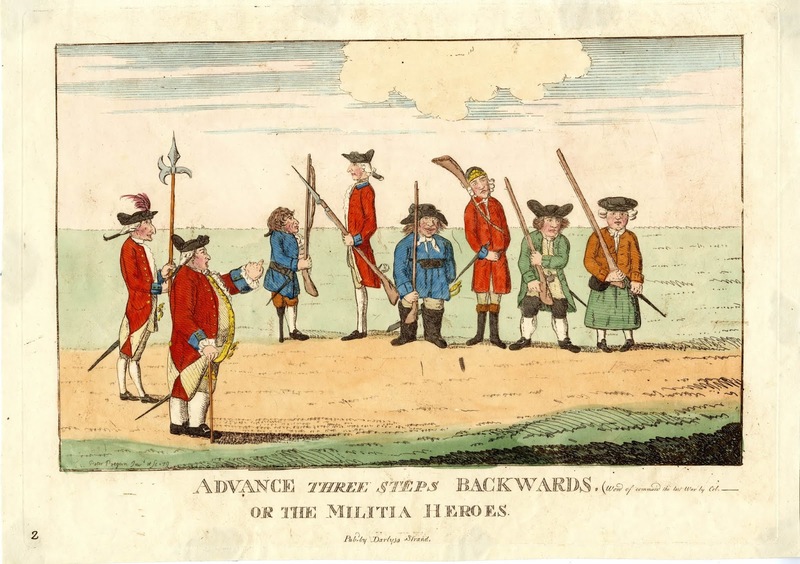 Threats of invasion of Britain saw a renewed emphasis on militia companies, but it appears that the printer Matthew Darly didn't think much of them. In this cartoon, Darly skewers the ragtag companies of British militia as inept. 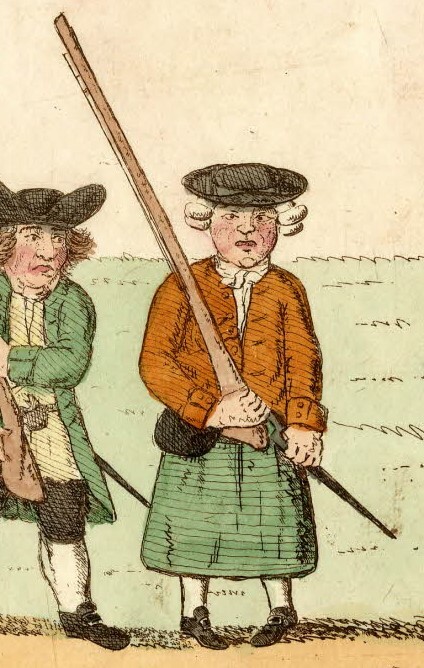 Muskets are angled all over the place, and the men of the company are of all sorts of sizes and shapes. The fellow on the far right is a sailor. He wears a round hat with an upturned brim over a bob wig. A white neckcloth is tucked into his single breasted jacket, which is orange/brown in one coloration, and blue with red cuffs in the others. His petticoat trousers are green in both colored prints, which I don't think I've ever seen before. Perhaps it was the same colorist for both copies, but it is the only consistent coloring aside from the red uniform coats with blue facings that the soldiers in the image wear. You're right that aprons may easily be confused with petticoat trousers. I've made that mistake myself. I would have been inclined to think he wasn't a sailor if it was that alone, since the petticoat trousers are not bifurcated. 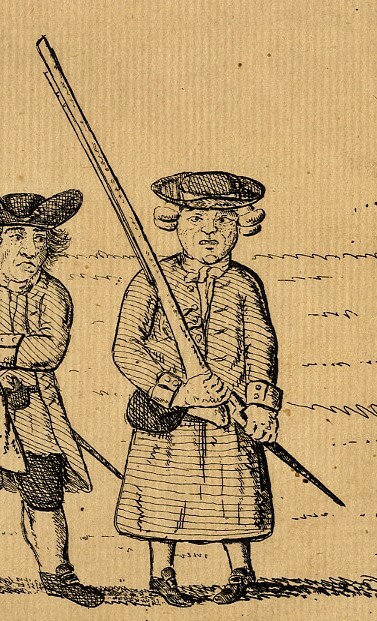 I base my decision on the specific combination of his round hat, bob wig, short jacket, and petticoat trousers/apron. Any one of these items in isolation does not necessarily make a sailor, but together they are repeatedly used to depict mariners. 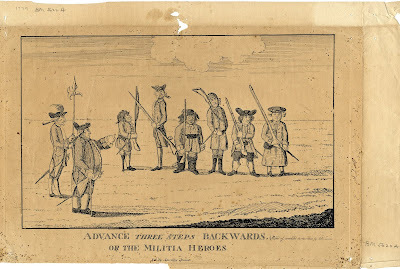 Just to play the devil's advocate, the militia man on our far left with the peg leg may be a sailor since old sailor's are often illustrated as having a peg leg & he has a short (blue) jacket that may be interpreted as a sailor's jacket. Sailor's are often illustrated as wearing breeches. Sailors are depicted wearing breeches (https://www.britishtars.com/search/label/breeches) and wooden legs (https://www.britishtars.com/search/label/wooden%20leg). There are two things that give me pause about classing the man on the left as a sailor. The first is his hair. 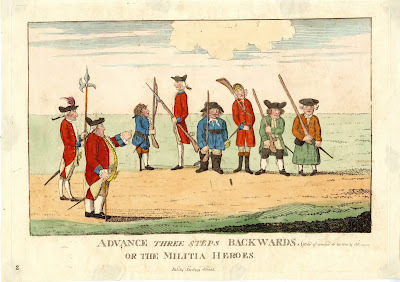 Sailors of this time are generally depicted as having short hair or bob wigs, with queues first starting to become popular around the end of the Revolutionary War (https://www.britishtars.com/2017/10/sailors-hair.html). Also for 1779, sailors' jackets tend to be tucked into their trousers or petticoat trousers, or cut somewhere between the top of the thigh and just below the waist. I am not dismissing the possibility he was intended to be a sailor (or perhaps a naval pensioner), but I'm not convinced of it either.